Today sees the release of the Second Estimate of the UK National Accounts, and thus the first chance to see NGDP data for the final quarter of 2015. Not only does it come in below 2% (using the quarter on same quarter of previous year measure) but previous estimates have been downgraded. 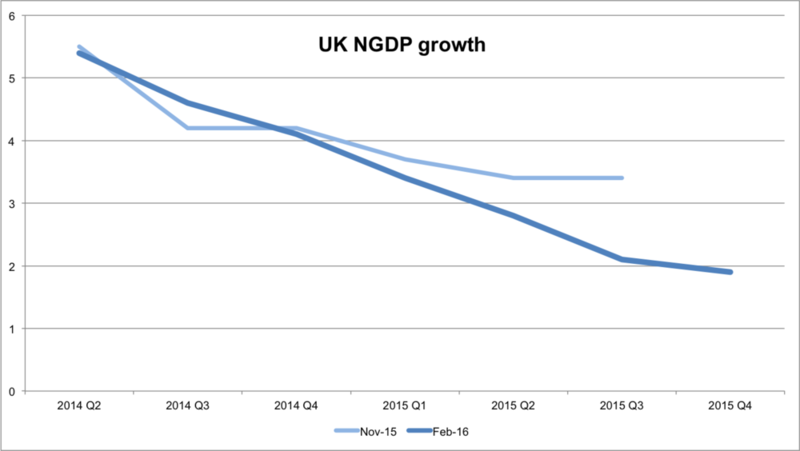 The chart below shows NGDP growth from mid 2014 to now, with today's figures (in dark blue) relative to the estimates from Noovember 2015. Coincidently, I have recently called for a ~2% NGDP growth target, and so I do not think this is bad per se. The problem is that the Bank of England had done a fairly effective job at returning NGDP to it's historic 4% rate (albeit without catching up on contractions in nominal income that ocurred during the great recession), and seemed committed to maintaining that. What we are seeing is NGDP falling below expectations, and this is highly concerning.